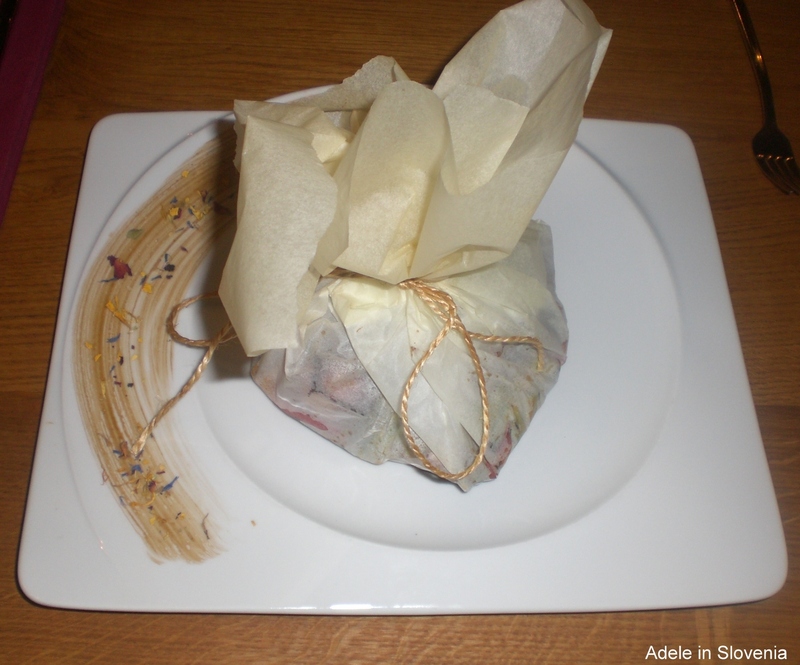 Na Kležnk in Lesce – First Class Airport Food! Did you know that there is an airport in Lesce? Well, ‘airport’ is a slight over exaggeration, airfield, to be more precise – the Lesce Alpine Flying Centre (Alpski letalski center). It offers panoramic flights above the Julian Alps, glider flights, skydiving and parachuting (more here – http://www.radolca.si/en/adrenaline-in-the-air/). I’m told that in the past there also used to be scheduled direct flights to Dubrovnik. What a shame that is no longer the case! Moreover, you can now also get first-class food there that doesn’t break the bank, which is not something that can often be said of airport food! However, this is no ordinary ‘airport’ restaurant. The Na Kležnk restaurant, which opened last year, has brought a much-needed revival to the centre, and it’s range of high-quality dishes and delicious desserts, are just the ticket! I was interested to know where the restaurant’s name hails from and found out that it comes from the name of a farm that used to be located in the area where the airfield now stands. 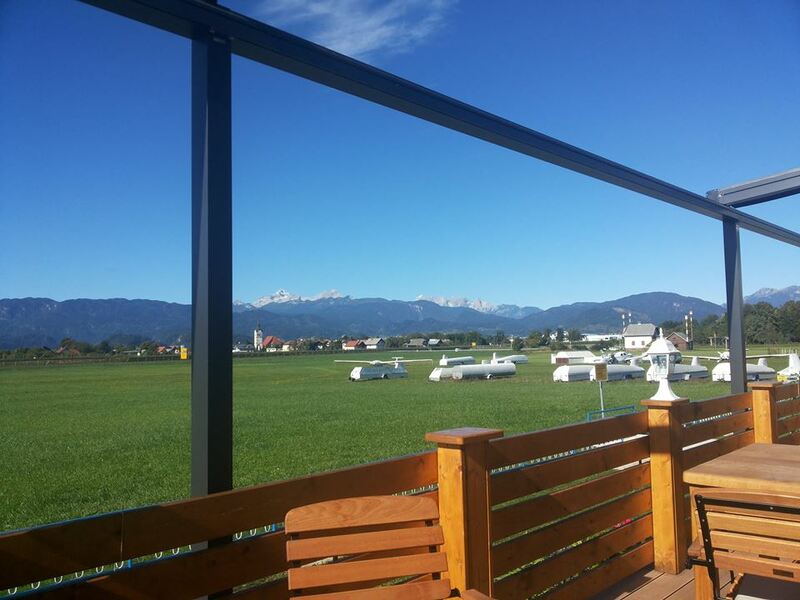 During the warmer months you can sit outdoors on the terrace and admire the views of the Julian Alps and the Jelovica plateau. My visit on a damp February evening wasn’t exactly conducive to admiring the outside views, but instead I was able to sit in the warm, pleasant ambience of the restaurant and admire the indoor views – mainly of the cakes! 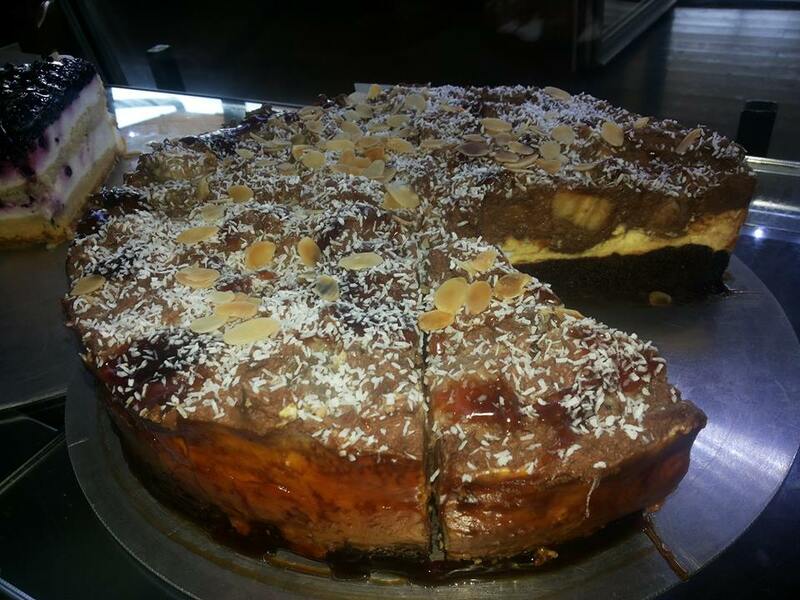 Na Kležnk has its own in-house patisserie, where delicious cakes are baked daily and can also be purchased to take-away, or they will even deliver if you have a sudden urgent craving for cake – it happens, you know! 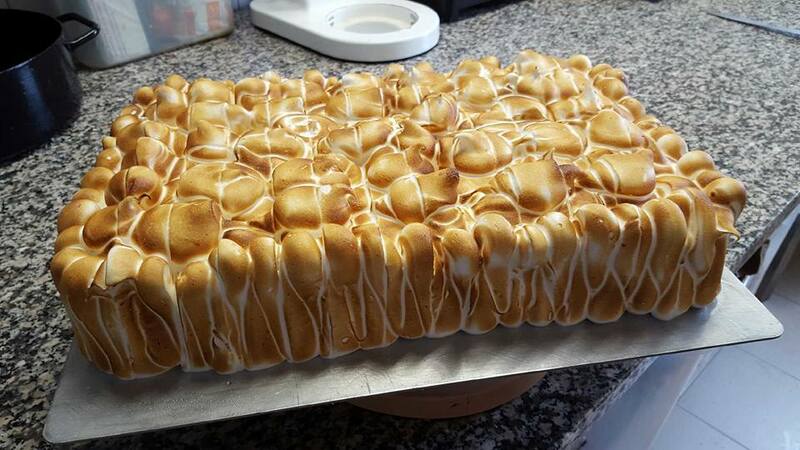 With such a wide range of cakes on offer, it was a tough choice, so I had a slice of this raspberry meringue cake to start, well I don’t mean as a ‘starter’ but as my ‘starter dessert’! And later a piece of the delicious, and highly addictive, banana mudcake ‘to go’! Oh yes, and I also ate some seriously tasty and imaginately presented ‘real’ food too! Starters include cheese ravioli with a pesto sauce and parmesan, and, as seen below, shrimp tails with crab pate. 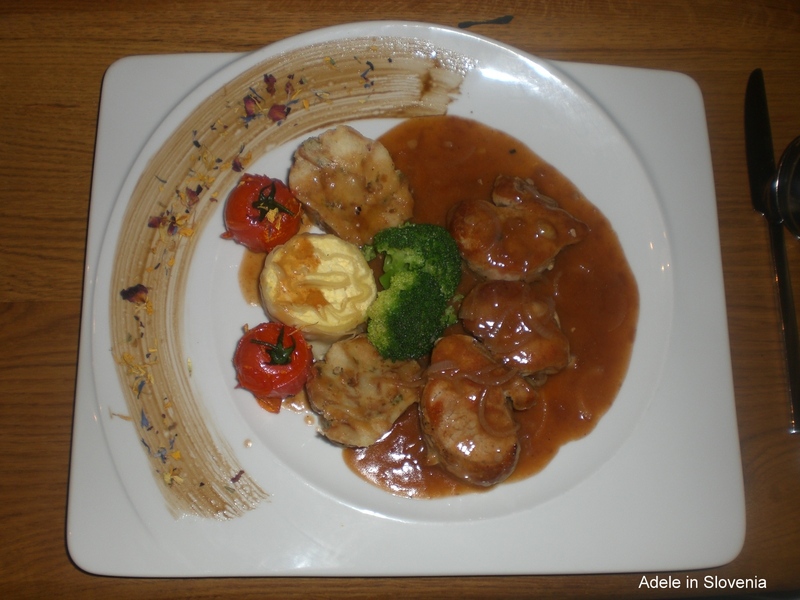 For my main course I chose a dish from the specials menu – pork fillet with onion sauce and bread dumplings. And my friend ordered the sea bass which came looking like this. And inside looked like this! Apparently, though, word is already out and, particularly if you go at the weekends for their popular Saturday and Sunday lunches, reservations are required. Now I too know why and am already looking forward to my next visit. 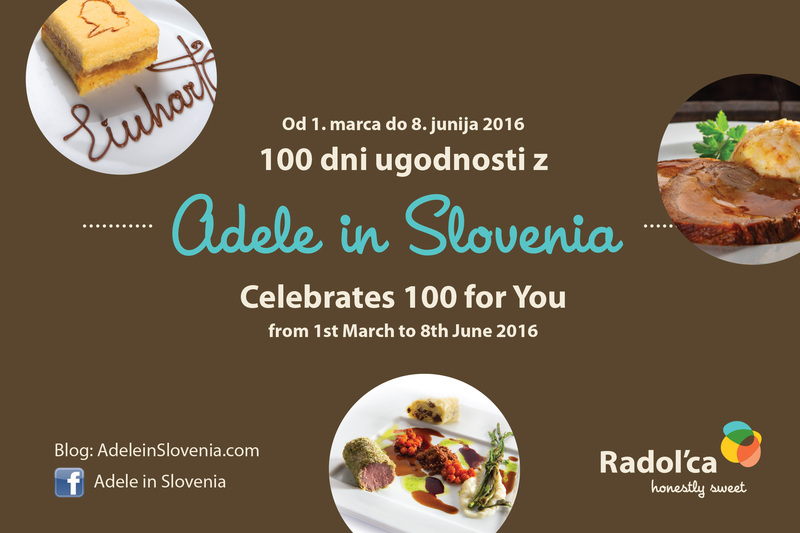 It is to be hoped that Na Kležnk will also join Taste Radol’ca later this year. 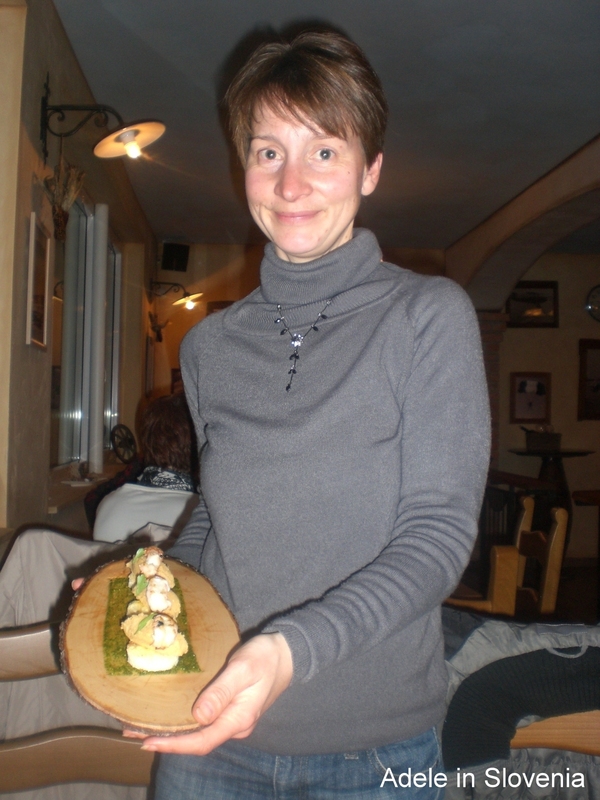 Although these days Top 10 lists are all the rage, I decided not to make this one since choosing just 10 of the many great Slovene foods would be difficult, not to mention what I consider the Top 10 would surely differ from what others consider the Top 10 and I could foresee controversy looming! 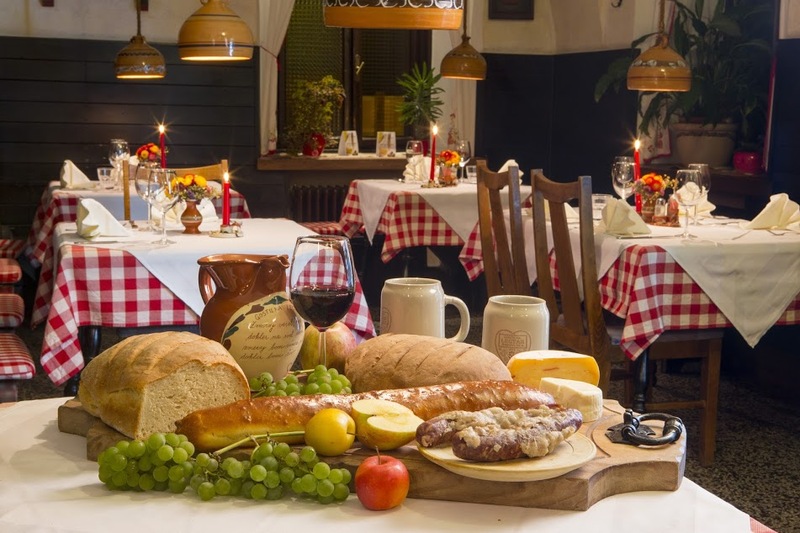 Therefore, this list presents just some of the’ Must-Try Slovene Foods’ and some suggestions for where to try them but is far from exhaustive and comprises merely my suggestions. 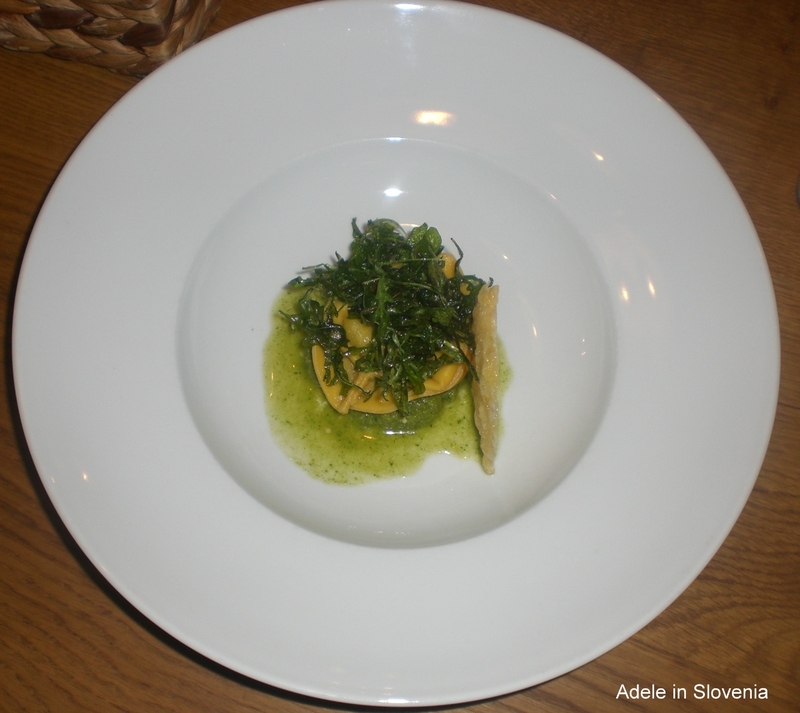 There are, many, many other great foods and dishes, not to mention wines, that you should also try whilst in Slovenia. Carniolan sausage (Kranjska klobasa) – This humble sausage has been the subject of great debate over its originality or ownership over the years and is probably one of the best known Slovene food products worldwide. 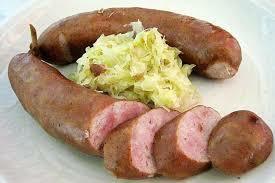 It is also one of the foods named a ‘Protected Slovene Product’. 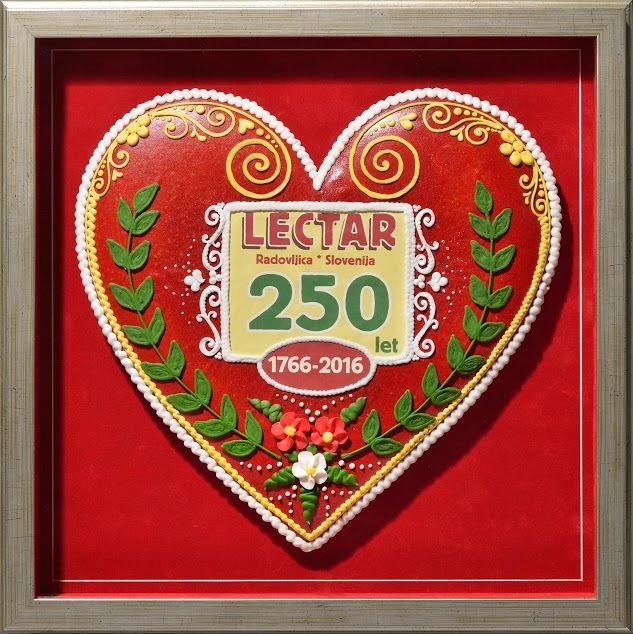 The oldest recipe for its production was found in the cookbook ‘Slovenska kuharica’ dating back to 1912. The several-time winner of the Best Carniolan Sausage is the Arvaj Butchers in Kranj. The sausages are often served with sour cabbage, as seen below, or can be cut up and added to stews, or just eaten simply with mustard (sorry but it has to be ketchup for me!) and crusty bread. 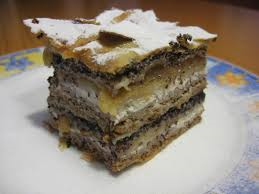 Gibanica – I’ve seen attempts to translate this as ‘Over moving Mura cake’, which is just plain ridiculous! 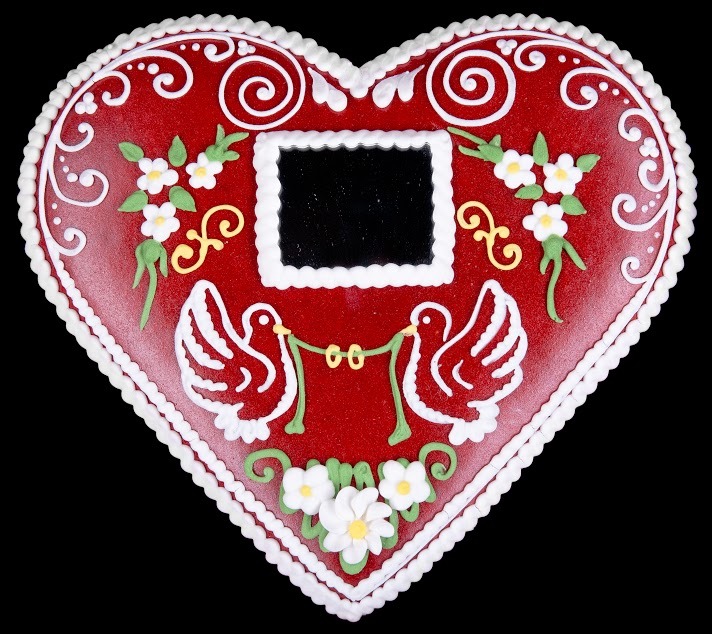 The ‘Mura’ part refers to the cake’s origins from the Prekmurje region of Slovenia. However, I believe some things shouldn’t be translated – let the cake do the talking for itself! 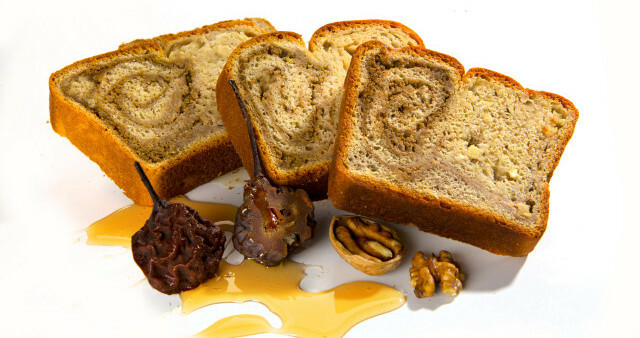 Gibanica comprises multiple layers of apple, curd cheese, ground walnuts, poppy seeds and pastry. I think it’s at its most delicious when served warm. 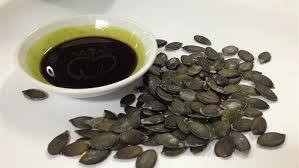 Pumpkin seed oil – Delicious, versatile and healthy! Pumpkin seed oil is most commonly used as a salad dressing, but these days you can also find it being used in a multitude of imaginative ways, such as drizzled over vanilla ice-cream – yum! 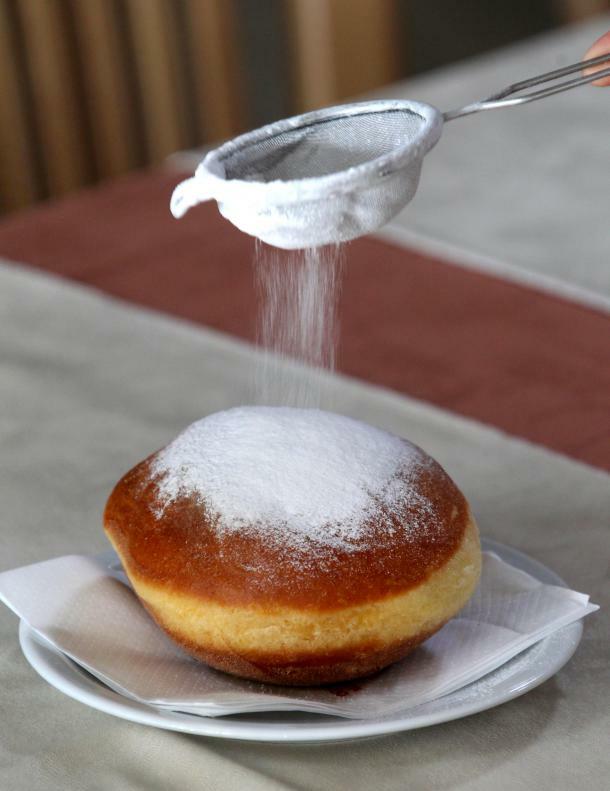 Potica – One of the most typical Slovene desserts, though actually I consider it less of a dessert, more of an afternoon tea kind of food as it is something between a bread and a cake. It’s a filled rolled loaf which can have a variety of fillings, the most common include walnuts, poppy seeds, or tarragon, but there are also many other different varieties including savoury versions containing pork crackling. 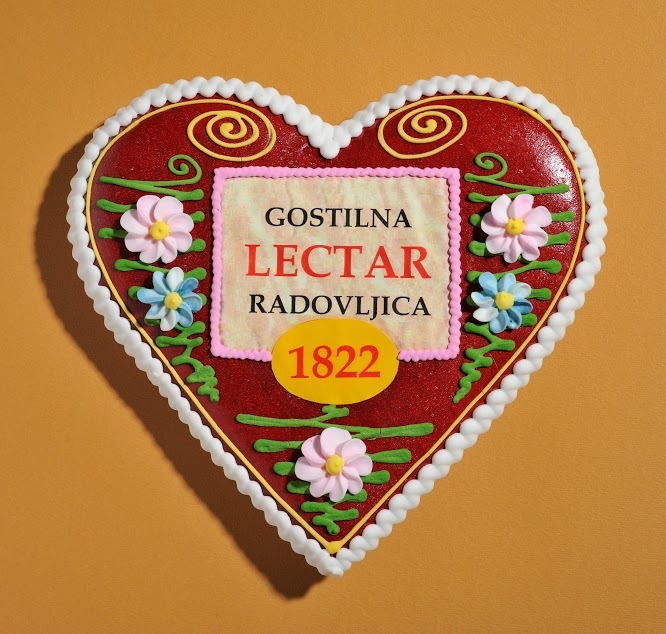 Traditionally potica is a festive bread, eaten at Easter or Christmas, though these days it can be bought and enjoyed year-round. Štruklji – I had a hand in making the štruklji in the photo below – though I must admit I had some help! 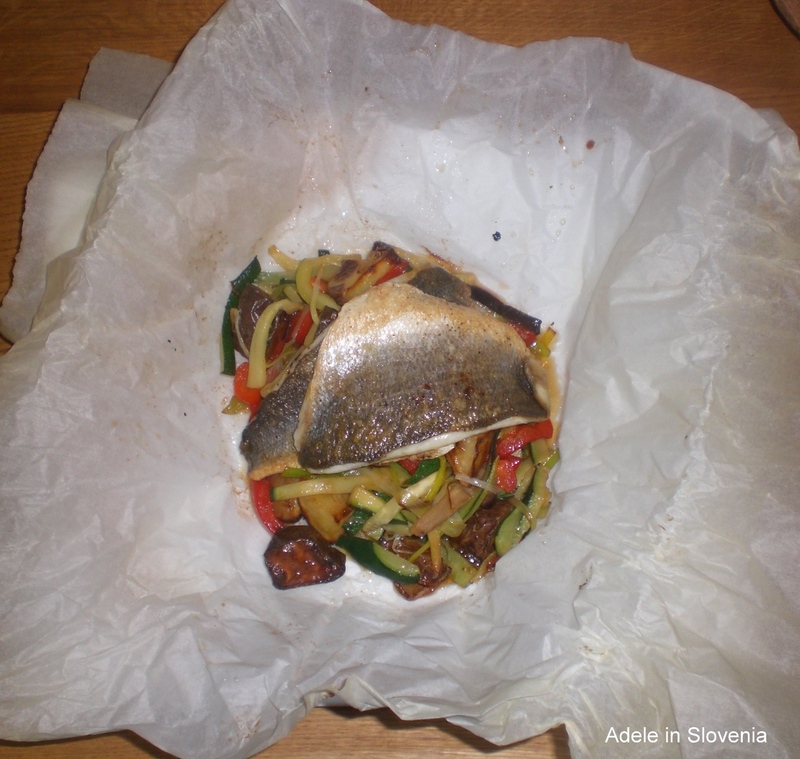 These were made at a cookery workshop I attended a couple of years ago at Pekarna Mišmaš. 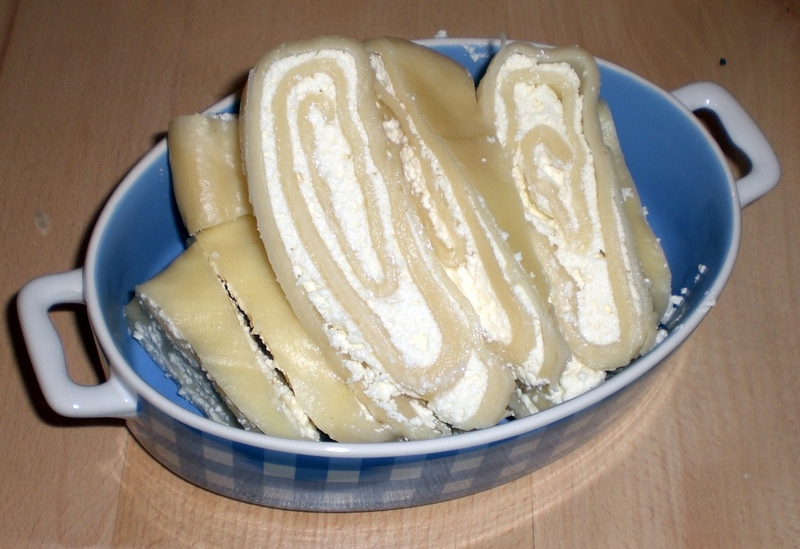 Štruklji are a type of rolled dumpling made with a light dough. These ones are filled simply with curd cheese, which is the most common filling, though the sky’s the limit in terms of fillings and they can be either sweet or savoury e.g. walnut, tarragon, blueberry. Žlikrofi are small boiled dumplings from the town of Idrija. As with other Slovene foods, there are a number of variations, however, žlikrofi originated in Idrija so it’s as good a place as any to find and taste them. Žlikrofi are made with a soft pasta dough and filled with a mixture of potatoes, onions and spices. They are often served as an accompaniment to meat dishes, such as hare or goulash, but can be equally enjoyed as a stand-alone dish with a light sauce. 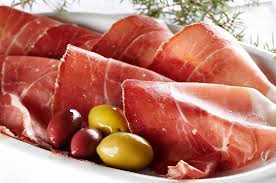 Pršut; Karst-dried ham – from the Karst region of Slovenia where the bora winds provide the perfect conditions for drying the salted meat, resulting in a delicious tender ham which goes perfectly with some local cheese and wine, adding to the Mediterranean feeling in Slovenia’s karst region. 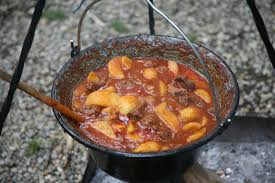 Bograč is a traditional dish from the Prekmurje region, on the border with Hungary, hence its similarity to goulash. Traditionally, this hearty stew is cooked in a cauldron and contains four different kinds of meat as well as onions, potatoes, pork fat, peppers and spices. 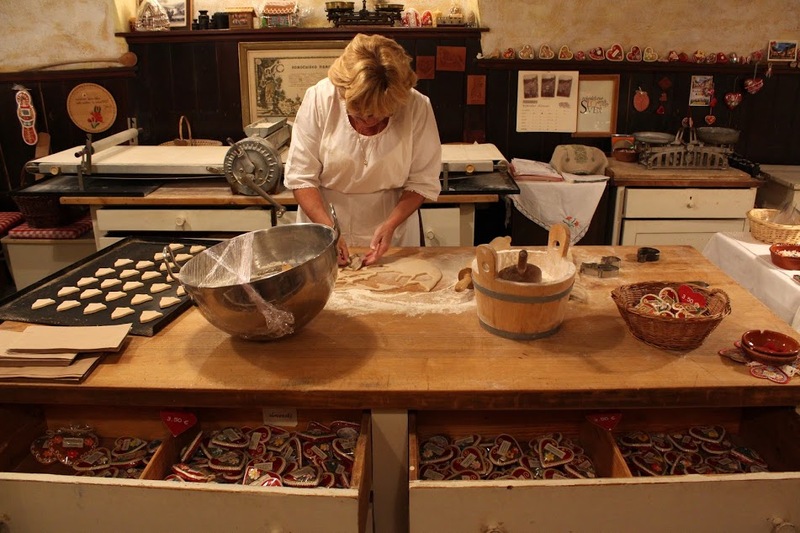 The annual Bogračfest takes place in Lendava where chefs compete to have their dish crowned the ‘World’s Best Bograč!’ These days you can find bograč served in many parts of the country, however, for the real deal, head to Prekmurje. Last year’s competition featured a record 108 teams from Slovenia, Hungary, Austria and Croatia, and the winning dish was cooked by chef Jožef Činč from the Lindau Lendava Motor Club. The 2016 event will take place on 27th August. Here you can watch a short video of last year’s bogračfest – just to get the taste buds going! 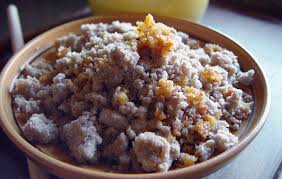 Buckwheat žganci with pork crackling – Žganci is another thing which I don’t like to see translated as it often ends up being described as ‘mush’ which, trust me, does not sound appetising! Personally, I think its ample to just write ‘buckwheat’. It is, however, a rather difficult to describe dish and, at first sight, can look somewhat unappetising but done well, it’s delicious! Alone it can be fairly bland but makes a perfect accompaniment to sausages and stews and is also often eaten with sour milk, particularly at mountain huts where the sour milk comes direct from the grazing herds. It really was tough choosing this list, as there are so many other delicious traditional Slovene foods and dishes I could have included e.g. krapi, ričet, jota, pogača, kremšnita etc. but I’ll save them for another blog some time! Until then, Dober tek! Carnival Time, Celebration Time and My Andy Warhol Moment in Radovljica! After almost two weeks of spring-like weather, snow was forecast for last Wednesday. However, in the end the snow didn’t quite make it down to ground level, where it instead rained, though snow fell above 800 metres. This will certainly have come as a relief to many of Slovenia’s ski resorts, particularly the lower-lying ones, and those without snow cannons, who desperately needed the snow and is perfect timing with school holidays rapidly approaching and it’s raining heavily today too, so there will be even more fresh snow in the mountains. 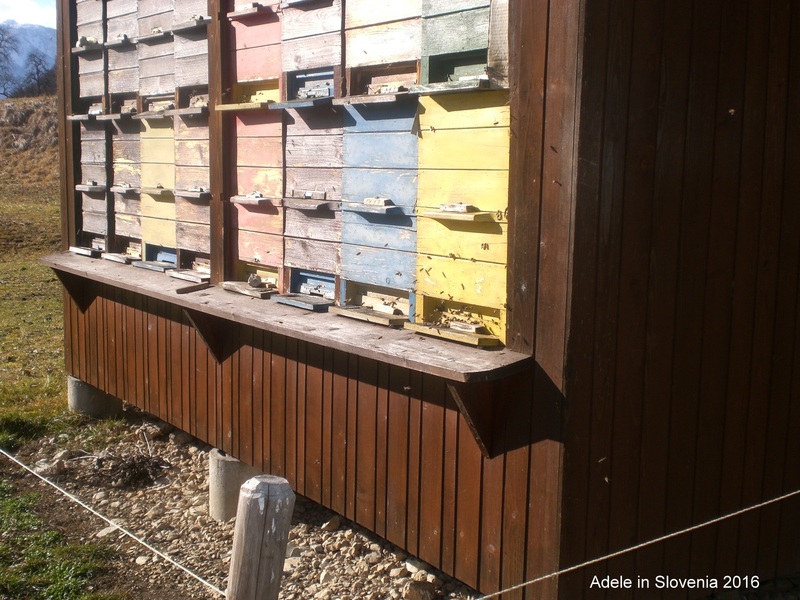 On Friday and Saturday last week the wonderful unseasonably warm spring-like weather returned and, when I popped to Bohinj for a meeting, I was amazed to see the bees at this hive so active and so many spring flowers in bloom. You’d never guess it was February, that’s for sure! Last weekend was a very eventful one, for me and in general! If, as Andy Warhol said, every one should have 15 minutes of fame, then mine came on Friday when the the tourism programme Na Lepše was dedicated, in part, to me and the success of my blog. Ok, it wasn’t exactly 15 minutes and it’s hardly fame, but I consider it recognition at least and I’ll take that! It was filmed in my home town of Radovljica – at the Tourist Information Centre, the viewing area with magnificent views of the Julian Alps and the Jelovica plateau, in the medieval old town and at the Lectar House of Tradition. Despite being rather nervous I must admit I was rather pleased with the outcome and also the response from readers of my blog. Here is the link to the programme which is, of course, all in Slovene, but even those viewing it outside of Slovenia will hopefully enjoy looking at the pictures and maybe it will encourage some of you to visit Radovljica too! (My part begins right after the ad-break, fast forward to 14 minutes). 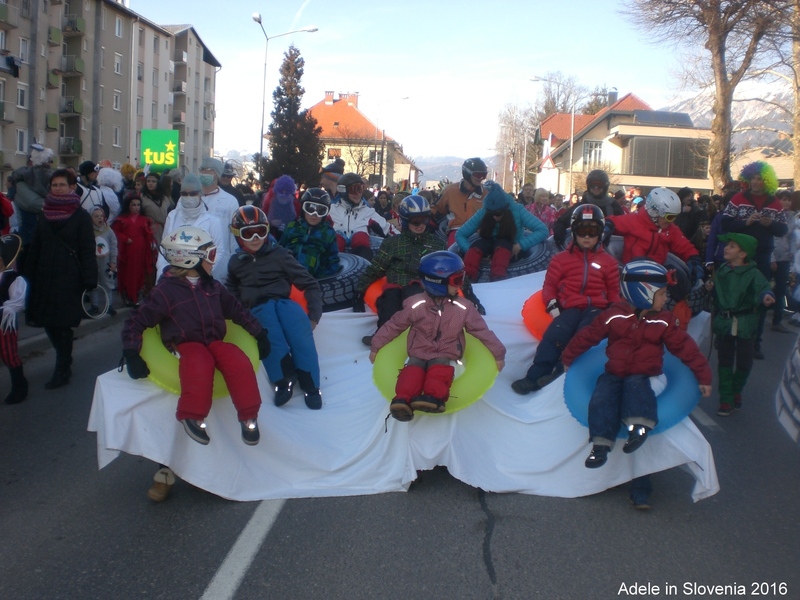 On Saturday the pust carnival parade took place through the streets of Radovljica. 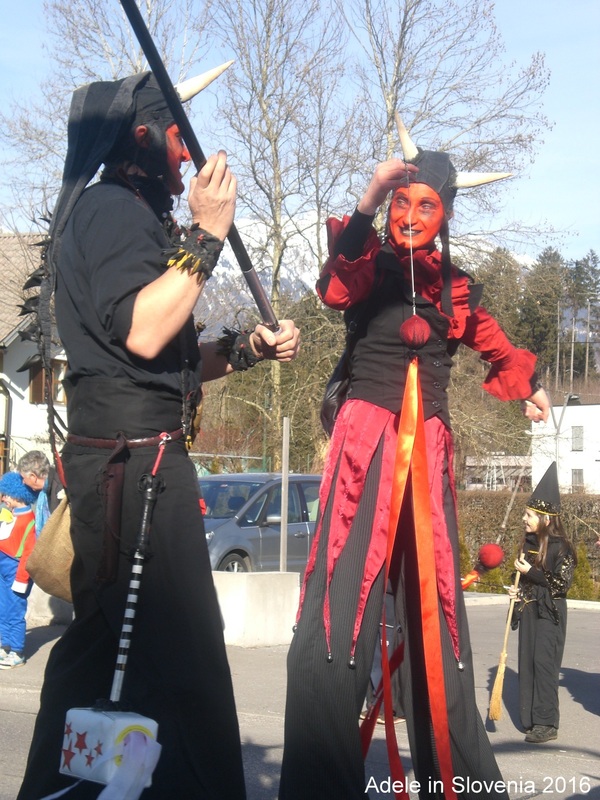 Carnivals take place throughout Slovenia for pust and although Radovljica doesn’t have its own carnival character such as the kurenti, laufarji and bedalci in other parts of the country, the locals – young and old – always make a concerted effort and the costumes and floats seem ever more creative by the year. Saturday was also a momentous day for one other reason. It marks the day that my blog had it’s 100,000th view. Wow!!! 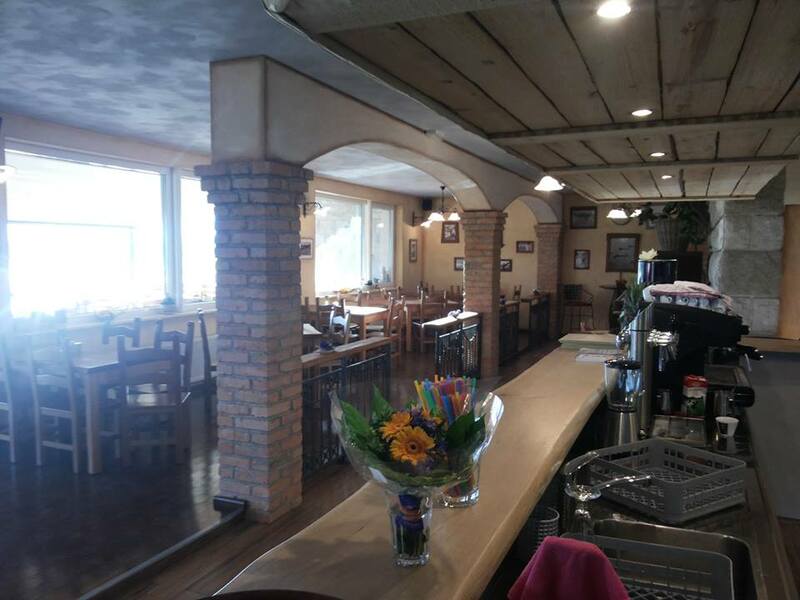 Since I knew this time was approaching, though in truth expected it to come in a month or so, I have begun to prepare a special package of offers for you, dear readers, to thank you for your readership, and also to involve the local community – particularly the Taste Radol’ca restaurants. There will be a whole host of discounts and special offers, so watch this space for more details coming very soon! 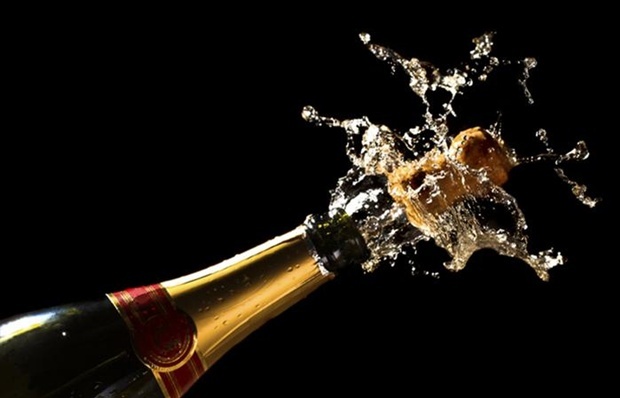 In the meantime, let’s crack open the champers! 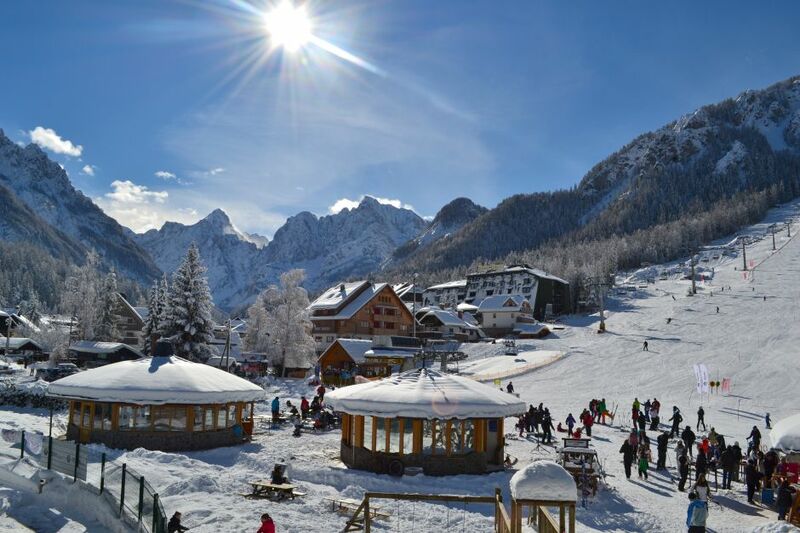 Winter Holidays in Kranjska Gora; So much more than ‘just’ snow! I’m not a fan of traditional winter sports, however, since living here I’ve had to get used to the fact that winter happens, and winter means snow. 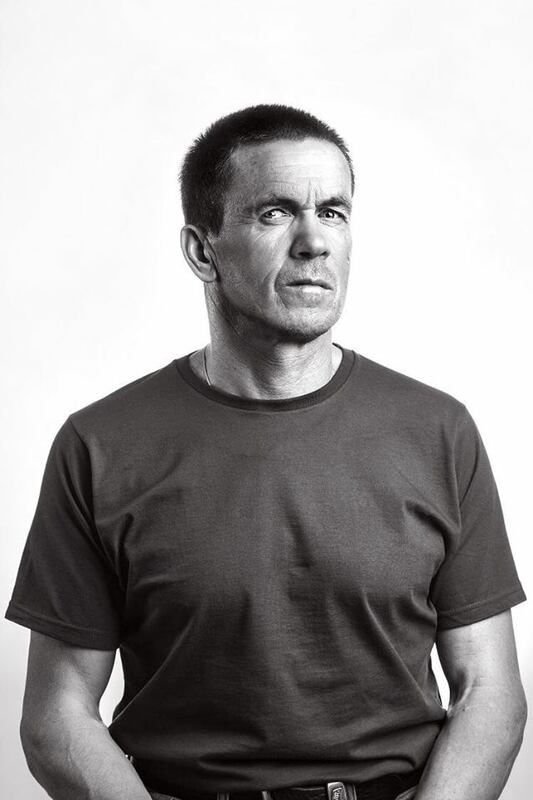 Therefore, I have learnt to participate in some alternative winter activities such as snowshoeing, winter hiking and, on occasion, cross-country skiing. One of the best resorts in Slovenia for winter-based activities, both traditional skiing-based as well as alternative winter sports, is Kranjska Gora. Though Kranjska Gora can sometimes affected by its relatively low altitude, and thus lack of, or meagre amounts of, snow, the resort has made concerted efforts to ensure there are plenty of other activities and events taking place during the winter season should lack of snow be a problem. 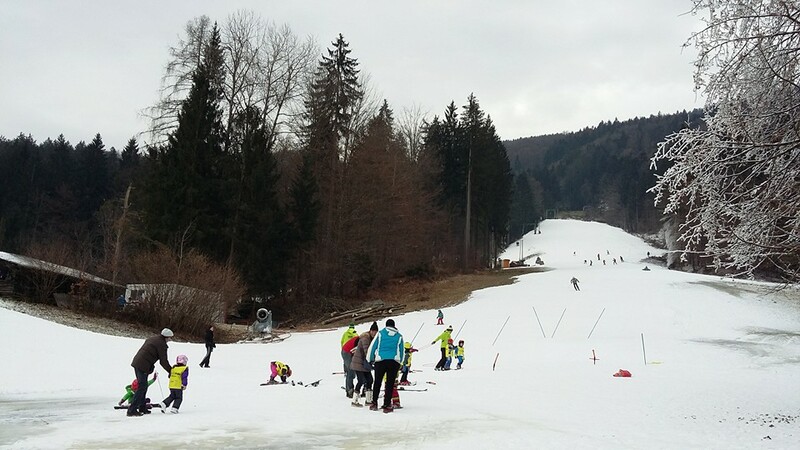 Here are just some of the things happening in Kranjska Gora this winter, where there’s something on offer for all the family, whether skiers or not. Kranjska Gora Welcomes You! which takes place weekly until the end of February on the snow beach behind the Ramada resort, comprises music, children’s entertainment and a presentation of what to see and do, and is an ideal way to acquaint yourself with all the resort has to offer. Skiing, of course, is the number one activity in Kranjska Gora. The slopes are particularly suited to beginners, though seasoned skiers will find some more challenging runs among the 18 ski slopes with 5 chairlifts and 13 drag lifts. As with any major ski resort, there are numerous ski schools and ski rental outlets. On a sunny day, with the backdrop of the magnificent Julian Alps, you can, I’m sure, see the appeal! 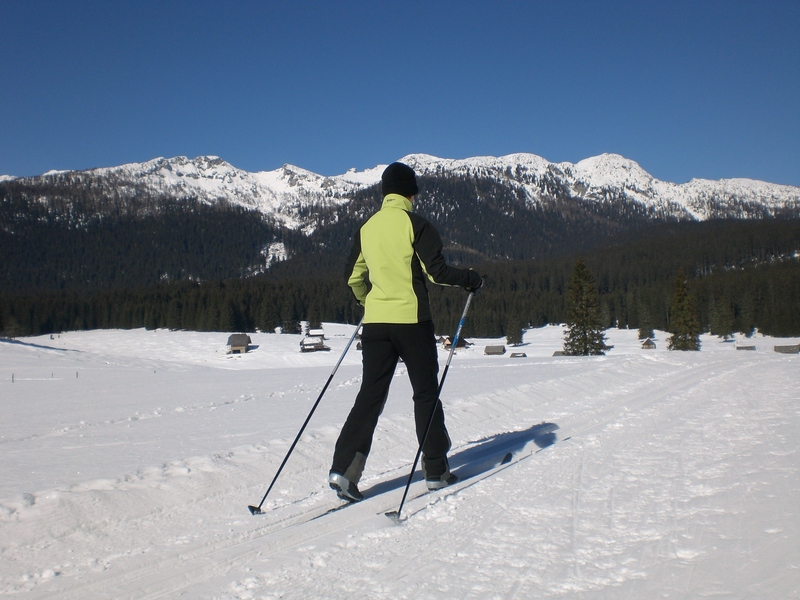 There are over 40kms of maintained cross-country ski trails. 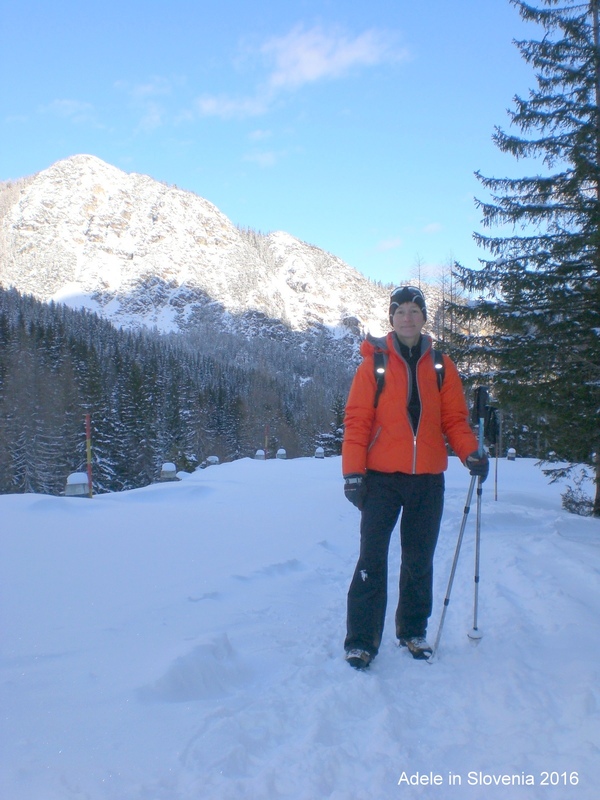 The keen-eyed among you will notice that whilst this is me, it isn’t me in Kranjska Gora! This is me on Pokljuka! Although I’ve tried cross-country skiing, alas me and skiing – in any form – just don’t, and never will, get on, but I wanted to include this photos just to prove that I have tried!!! The Vršič pass, which leads from Kranjska Gora to the Soča valley, is usually closed for much of the winter due to snowfall. * Providing someone has blazed a trail before you, it does, though, make a great place for a winter hike. Below you can see me on the road – yes, that’s a road! – at bend 17, with wonderful views of the Julian Alps. I must stress though, that you do need to be well-equipped for winter hiking and be sure to only follow worn trails if you don’t know the terrain. When there is heavy and fresh snow, hiking isn’t always possible so a pair of snowshoes are called for. 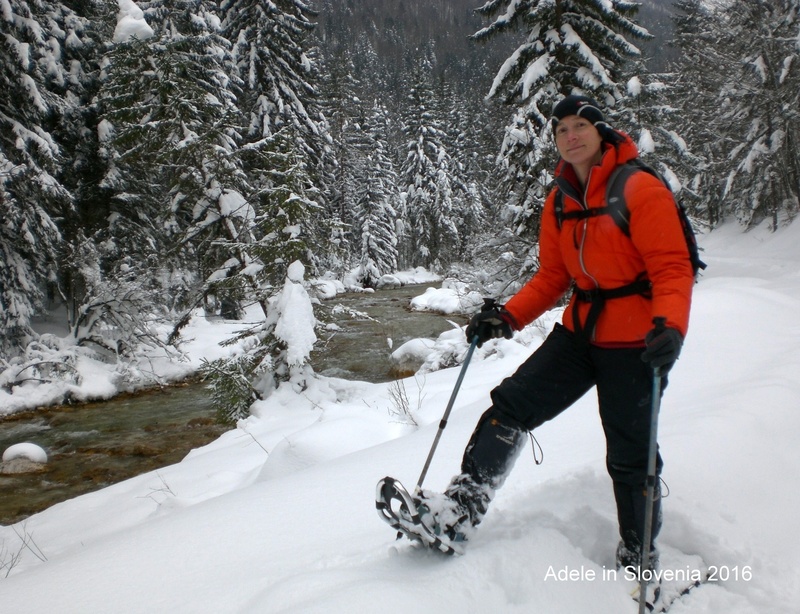 Snowshoes enable you to traverse the snow without sinking in it up to your waist – or deeper! They fit over regular winter hiking boots and are easy to use, though do feel somewhat ungainly to begin with. Husky sledding trips can be booked and arranged in Kranjska Gora, though actually take place just over the border in Italy. The Eskimo Village comprises a hotel, restaurant and bar. Guests can partake in a number of fun snow-based activities such as snow golf, igloo building, and sledding. 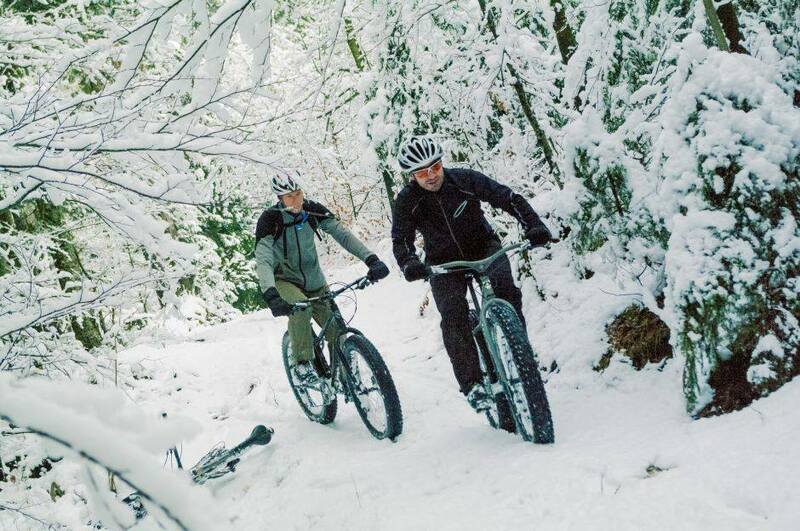 You can even cycle in the winter at the Winter Bike Park. Hmm, much as I love cycling I think I’ll give that one a miss, but I’m sure it’s an adrenaline-junkies dream! 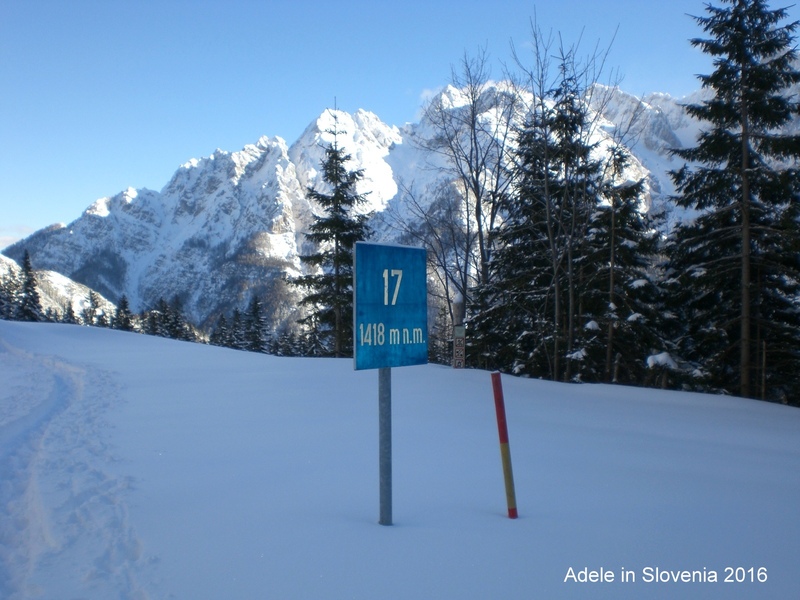 You can also see more about winter sports in Slovenia in this short video.